This post has been sponsored by HERSHEY’S + Jet Puffed + HONEY MAID. All thoughts and opinions are my own. Moving to a new neighborhood brings with it all sorts of exciting opportunities. One of my favorites is making new friends as we get to know the neighbors. In past moves, we have rang doorbells and delivered neighbor gifts to say hello and introduce ourselves. This time around, in our new house, I am going to jump right in and host an open house block party with a simple and delicious s’mores buffet! Today I am going to share some of my ideas about getting to know the neighbors with you, as well as three fun variations on classic s’mores. So whether you’re new to your neighborhood or not, you can host a buffet and enjoy these s’mores for any occasion. Why Should You Get to Know Your Neighbors? There are a bunch of benefits to knowing your neighbors. When people recognize each other, they also are able to recognize intruders or notice compromising situations. Building a sense of community helps you feel more connected to your home. Kids who know other kids in the neighborhood are never at a loss for playmates. Also, it is always really nice to have someone to call when you get half-way into a recipe and realize you’re out of eggs. We have been super lucky in all of our homes to have amazing neighbors. In the last several places we lived, we even recruited good family friends to move in next door so we could have a built-in support system. It was really fun. With this recent move, we didn’t choose our neighbors, but we lucked out with some great people all around our new house. The block has about a dozen kids our own kids’ ages, as well as young families with babies, newlyweds with new puppies, older more established families, and retired couples with enviable landscaping. We have been able to casually meet a lot of them out on the sidewalk or wandering back and forth from the bus stop, but want to invite everyone over for an informal open house to begin building more meaningful neighborhood relationships. There is something really different about saying “hello” on the driveway and actually passing through someone’s back gate into their yard to roast a marshmallow and build a s’more. Inviting people over to your house or yard makes them feel invested in and thought about! I’m going to create a simple flyer to send the kids around to deliver, or tuck into the neighbors doors along the block, inviting them to our “Getting to Know You S’more Block Party.” I just came up with that right now. Pretty punny, right? 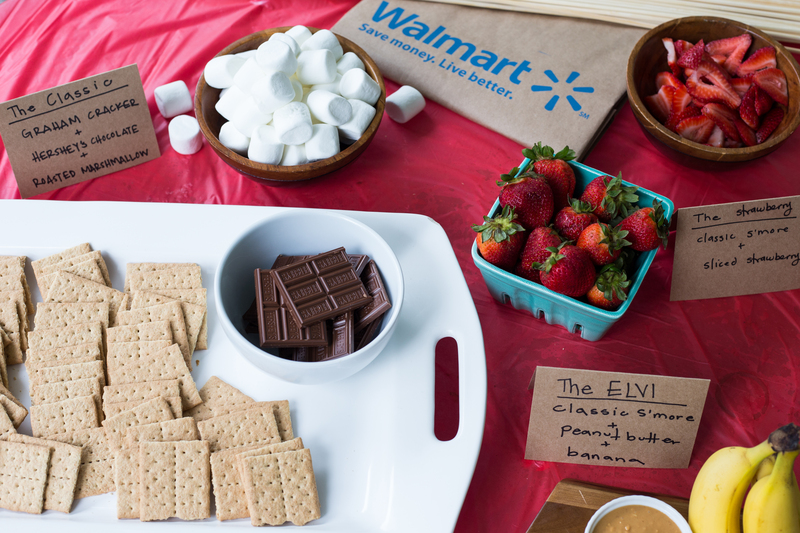 I love the idea of creating a simple s’mores buffet for a neighborhood block party because s’mores are classic, nostalgic and so ubiquitous. Most people have heard of or tried a s’more at one time or another (or, if they are like me, makes them multiple times and in numerous variations all year long every year!) I always look forward to my first s’more of the summer. It makes me feel like a kid and brings back so many fun memories of adventures shared around a crackling fire. Chatting about s’mores memories can be an icebreaker for people to get to know each other, and the interactive nature of making the s’more—roasting the marshmallow, choosing some fillings, and building the finished treat—gives people something to do with their hands and an activity to keep them from getting too nervous or feeling awkward. It’s a perfect way to combine something to eat AND something to do at your party. For this buffet, I want everything to be easily accessible, easy to understand, and fresh. 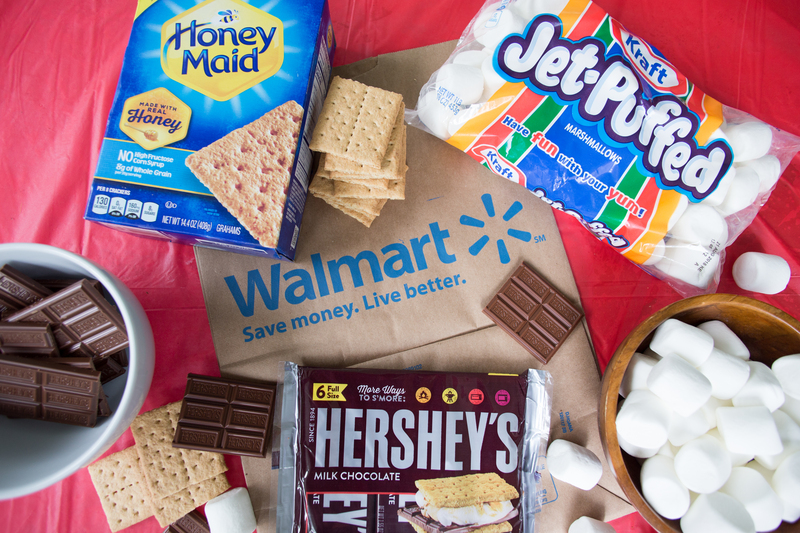 I started by heading to my local Walmart to pick up the classic s’mores ingredients: HONEY MAID Honey Grahams, Jet Puffed Marshmallows, and HERSHEY’S Chocolate Bars (in the convenient 6-packs). Walmart must have known I was coming because they had a s’mores display with all three ingredients, plus some perfect bamboo roasting sticks, all together for me to easily grab. I also suggest picking up some HERSHEY’S Cookies & Cream Bars for delicious cookies & cream s’mores! Shop for your favorites at Walmart! In addition, I came up with a couple fun variations that simply build upon the classics. 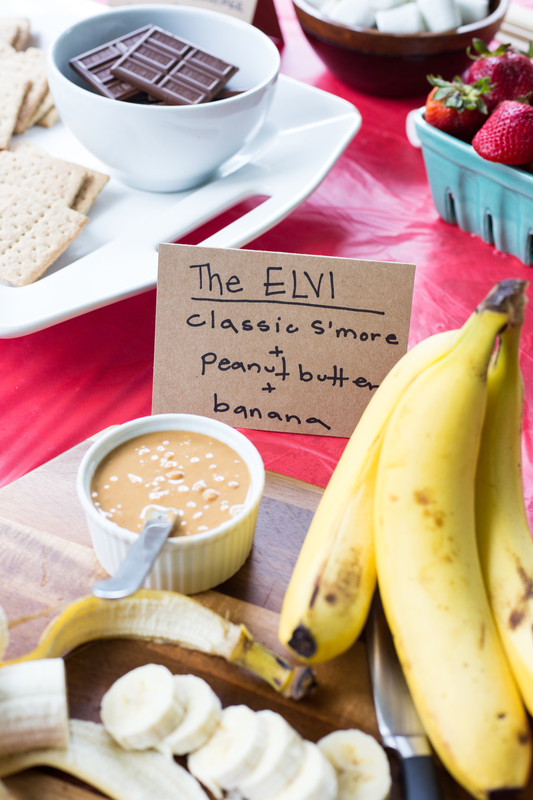 THE ELVI includes a swipe of peanut butter and a couple slices of banana on one graham cracker before adding the chocolate and roasted marshmallow. 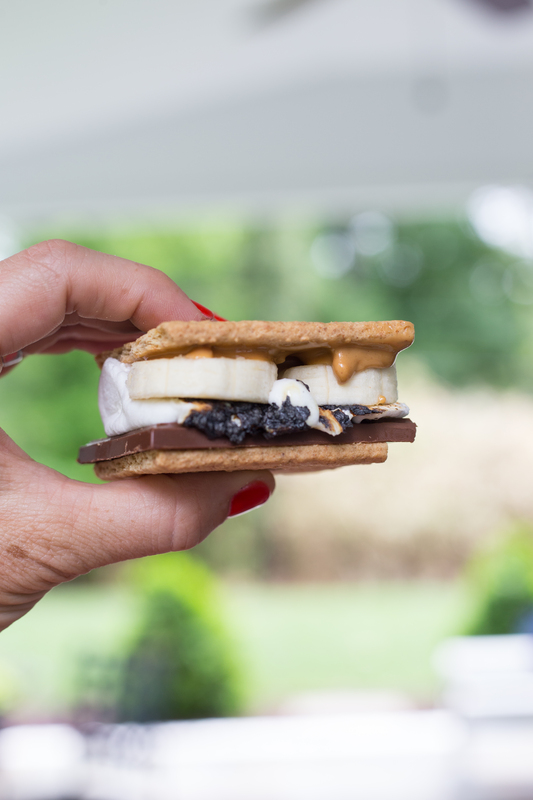 Apparently Elvis Presley was a peanut butter and banana fan, and this combo added to the original s’more is delicious. 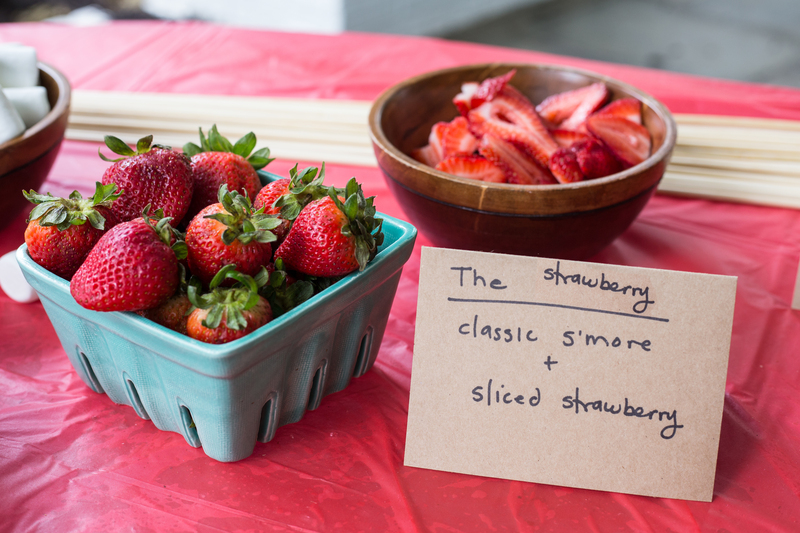 THE STRAWBERRY includes slices of fresh strawberry. 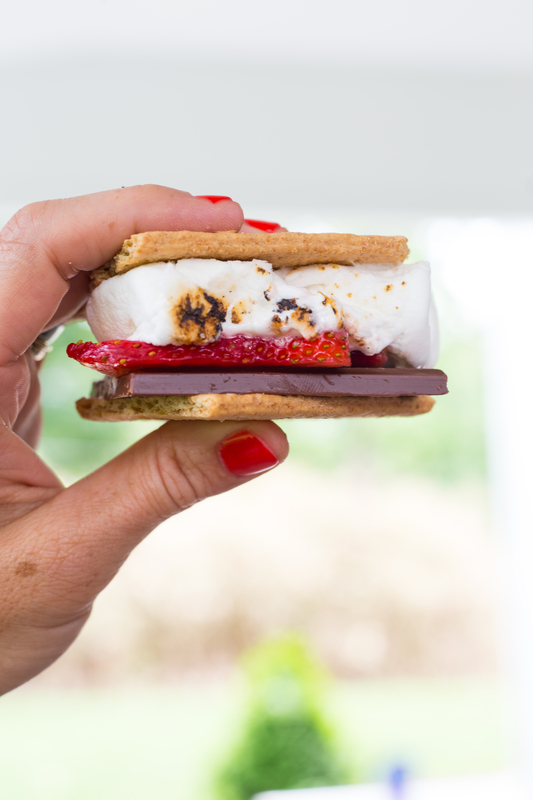 That bite of sweet and tangy with the s’more tastes just like summer and is spectacular. THE HIPSTER is made by adding a couple cranks of coarse sea salt to the chocolate before topping with your mallow and gosh I’m a fan. Blank folding cards can be made into recipe references and set near the variation ingredients. A plastic tablecloth keeps the inevitable mess at bay and making sure the bamboo roasting sticks are readily available for neighbors to grab will keep the open house flow moving smoothly! 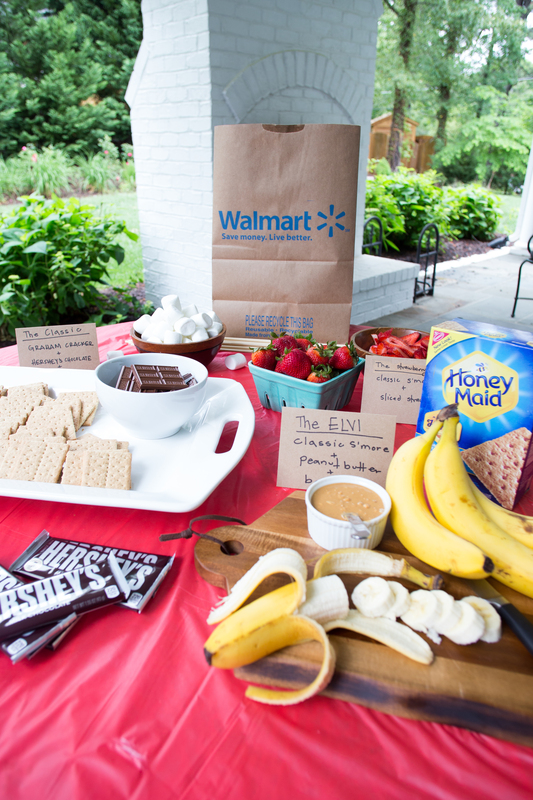 I’m excited to get to know my neighbors with this fun s’more buffet, and I hope you’re inspired to visit your local Walmart to pick up what you need to host one of your own! Getting to know some the neighbors is a great way to begin the summertime season and feel even more connected to your home, community, and city. 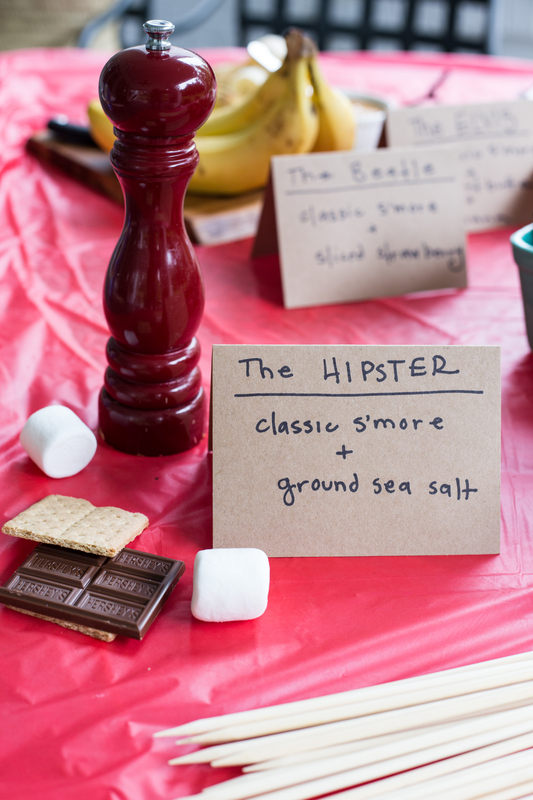 What better way to build those relationships than with s’mores? What are your favorite s’more combinations? Share them in the comments so we all have more ideas for our summertime roasting!